ADULT Turkey with Sweet Potato & Vegetables 395g Grain Free, Wheat Gluten Free, Dairy Free or Egg Free. Turkey, brown rice and vegetable dinner made with 100% natural and wholesome ingredients. This highly digestible meal has been slow cooked to retain maximum goodness. ADULT Duck with Potato & Vegetables 395g Grain Free, Wheat Gluten Free, Dairy Free or Egg Free. Chicken, Tripe, brown rice and vegetable dinner made with 100% natural and wholesome ingredients. This highly digestible meal has been slow cooked to retain maximum goodness. 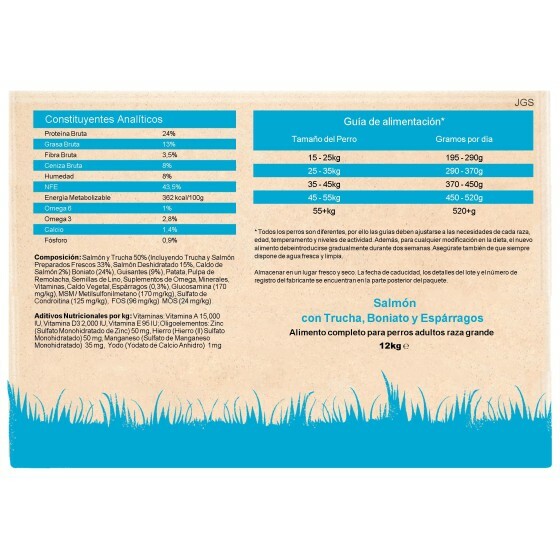 44% Fish and Potato with Itch-Eeze is designed specifically for dogs with allergies and very sensitive tummies. Chicken, brown rice and vegetable dinner made with 100% natural and wholesome ingredients. This highly digestible meal has been slow cooked to retain maximum goodness. Free Delivery 42.50€ & over. We send to Spain, Portugal, Italy and France. All areas. Spain: Gijon, Oviedo, Aviles, Álava, Albacete, Alicante, Almería, Asturias, Ávila, Badajoz, Baleares, Barcelona, Burgos, Cáceres, Cádiz, Cantabria, Castellón, Ciudad Real, Córdoba, La Coruña, La Rioja, Cuenca, Girona, Granada, Guadalajara, Guipúzcoa, Huelva, Huesca, Jaén, León, Lleida, Lugo, Madrid, Málaga, Murcia, Navarra, Orense, Palencia, Pontevedra, Rioja, La, Salamanca, Segovia, Sevilla, Soria, Tarragona, Teruel, Toledo, Valencia, Valladolid, Vizcaya, Zamora, Zaragoza. Sole Importers and Distributors of Natural Products since 2006. Our warehouse is climate controlled to ensure all products are sent to you in optimum condition! Easily maintain your dog's health and well-being, at an affordable price. We provide a range of natural pet foods, treats and supplements that have been developed to provide optimum nutrition for your pet using GM free 100% natural ingredients. We work to minimize the impact of our business on the environment, using reused and recycled cardboard boxes in some of our shipments. e.g. you might get your order arrive in a box reused several times, or even custom made boxes with leftover cartons filled with other reuseable packaging. Although experience is not "aesthetically beautiful" it is more environmentally friendly.